Especially when writing personal history, biography, remember to check all records, not just the ones that may provide birth, marriage and death records. Think outside the box. 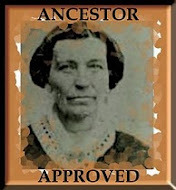 Leslie Huber at the BYU Family History Conference (don't miss Leslie's new book--The Journey Takers) recommends financial records, school records, payment and employment records, records of societies to which your ancestor belonged, and that old favorite--newspaper articles. Obituaries are always a must--the great-grandpa I'm now writing about had 5 obituaries in different newspapers. Of course some of the information overlapped, but some is different. But the most interesting news article I've ever read was about another great-grandpa and his adventures in his "family benzine buggy." The Box Elder News reports that "the party had such a close call that Mr. Christensen stated yesterday he would have sold the machine for twenty five dollars and a song, if some one had come along and offered it to him, and would have cranked it up to boot." That quote is a golden look into my Great-Grandpa C.N. 's personality as is his exciting auto ride and the family's "Close Call to Death." On a christening record, who carried the baby? On a census, who is listed on the same page or next page, the same post office in a small town? On the ship manifest, who else emigrated at the same time from the same place? Noticing and finding out more about these "neighbors" helps the researcher to break through brick walls, and most significantly for the writer, it gives us somewhere else to look for the details we crave about our person. One particularly easy and rewarding way to do this for a Mormon emigrant ancestor is by using the historical resource (not on familysearch), the Mormon Overland Travel site (1847-1868). While this is an incomplete listing because rosters have not been found for all companies, it is very helpful. For two different families that I have written about, I was able to make a very good guess as to which company the family traveled with simply by noting their traveling companions on shipboard and reading the accounts given on this site. Putting the information together gave me a good picture of what my family's experiences would have been even though I had found nothing written by them. When you have found "your" company, be sure to click on "View a list of sources" which will give you trail excerpts from those sources as well as where to look next. 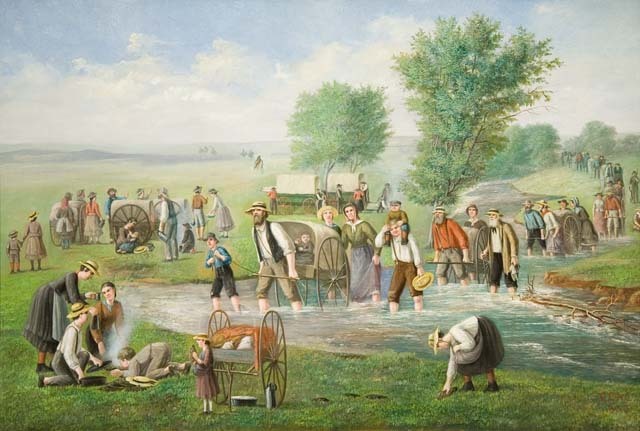 A similar resource, less well known, is the Mormon Migration (1840-1890) website hosted by Brigham Young University's Harold B. Lee Library. This site includes over 1,000 first person accounts of over 500 LDS immigrant voyages. 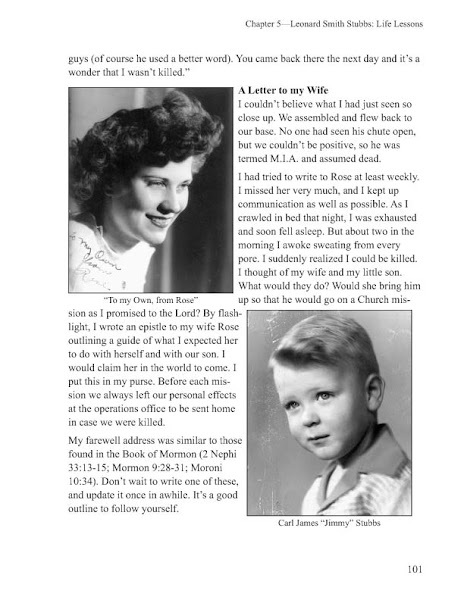 It's a treasure trove for someone researching and writing about an early LDS immigrant. Remember, you do not have to find your particular person there. Read the accounts of anyone on the same voyage, and you will know the events that your person also experienced. After much research and thought about my ancestor Jens Jorgensen and his wife Marie, I believe they traveled with the 7th Handcart Company in 1857. Family stories, traditions and dates combined with the excellent historical resources found on the sites listed above led me to that conclusion. Imagine my delight when I found a book (Before Zion by Allen Christensen) written specifically about this particular company and also realized that a CCA Christensen painting I had always loved, Handcart Company, was based on this journey with my 3rd great-grandparents. "Dig deeper," Leslie Huber advised us in our class about uncovering our ancestors' stories. She recommends putting the known events of a person's life into a timeline. And include major world events, local events and events from other people in that person's life. This timeline helps us get a feel for the flow of life and possible cause and effect relationships between events. Check out Leslie's website for more ideas on researching and writing. My experience with writing family history has brought me to the same conclusion. Writing a timeline is always one of my first steps in doing a biography. When I look at the timeline, I can see holes in my research. I start to get ideas of where I need to learn more about a time period, a place or particular events. It also gives me an ideal place to begin writing--not necessarily in the same order as the timeline, but I see his or her life in a shorthand version all spread out before me. Then I can look for turning points and themes. Leslie Huber does this in her book about her ancestors. The theme she writes about in The Journey Takers is their emigration and she weaves that theme through the story of each of her emigrant ancestors. 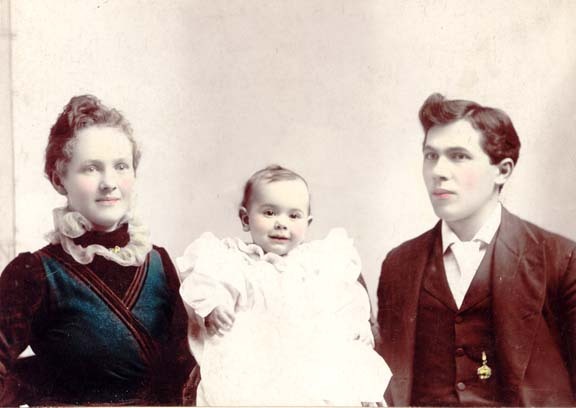 The notation on the back of this photo instructs the colorist that Great-Grandma Annie's eyes are light blue, but they didn't turn out that way. Another much larger portrait of Annie with much more coloring does show her blue eyes. Was that portrait ordered by her mother as this one was? What did they cost her? Annie died very young, many years before her mother did. I can imagine that Great-great-grandmother Anna Britta was glad many times that she had these done. My daughter also died as a young woman and I love the photos left from her life. I'm in love with a new book. The author, Leslie Albrecht Huber, is an expert researcher. In her book, The Journey Takers, she intersperses the story of her own life journey with that of her ancestors' emigrant journeys. The stories of her discoveries and of their experiences in their life-changing "journey" to the new world is engaging. And I relate to Leslie's research experiences. On doing research: One thing Leslie recommends is that we dig a little deeper into the sources we already possess to make sure we are extracting everything there--not just the dates and places. Pay attention to clues about occupations, other people in the records, causes of death, the informant, notes added. Recently I have been cataloging a collection of family photos and it is amazing the clues I have found--on the back of one old photo was the order form to hand-color the photo, including the eye and hair color of my great-grandparents (see photo above). It was my great-great grandmother who made the order and her address was included! My personal hint is this: always scan the back of the photo as well as the front and link them together in your e-files. As I puzzled over a Danish census record one day, wondering what happened to two of the children listed, I suddenly noticed a tiny "2" after the word "gift" (married) for the father. The mother had a "1" by her marriage notation. I looked at their comparative ages. He was much older. After some further research, I found another marriage--his first wife. Leslie is right. It pays to study the records we already have. I know there is still gold to be mined from my husband's great-great grandfather's lengthy pension record. One way I have found to find this valuable information is to completely transcribe the documents involved. It's on my list, Leslie!